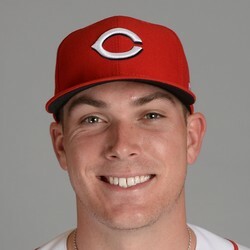 Reds prospect catcher Tyler Stephenson went 2-for-4 Sunday for Daytona (A+) to continue a very hot start to the season. He leads the league in average, slugging %, and OPS. He is second in the league in OBP, hits, and XBH. He has had some injury issues since being drafted in the 1st round by the Reds in 2015, but many believe if he can stay healthy this year, he is a prime candidate to become one of this year's breakout prospects.